rv-c.com | Your Source for RV-C Information. 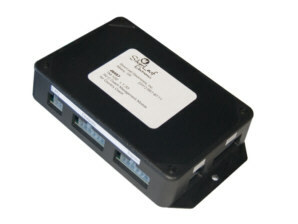 Think of it as an Electronic Control Unit for the RV. Just as the ECU in the engine controls and coordinates all its important functions, the TM-102 manages all the major RV systems. It monitors and controls the tank levels, inverter/charger, generator, batteries, water pump, and many other pieces. It can be configured to provide a wide variety of intelligent features, such as tank autofill, automatic genstart, chassis battery charging, safety interlocks, and even full climate control. It is fully RV-C compliant, and can be configured with the OmniScope RV-C service tool. The TM-102 is a fundamental part of an full-featured RV-C network. It can be combined with any control panels and other RV-C components to create a powerful, customized system.